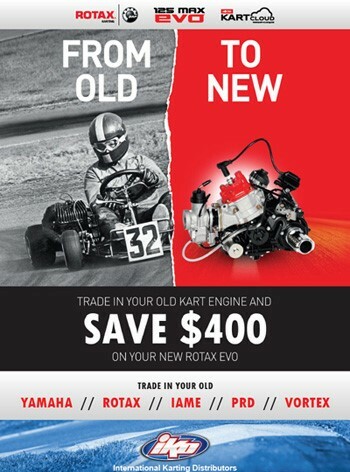 Trade in your old engine to receive $400AUD off the regular price of a brand new Rotax 125 MAX EVO Kart Engine. Offer valid until 20th June 2018. Offer limited to 2-Stroke Kart Engines and only 1 exchange per customer. Offer available to all participating Rotax Kart Dealers in Australia. Find your local Rotax Kart Dealer HERE. *Conditions Apply – The old engine must be returned to IKD before the discount will be applied. The engine must be in working, usable order for the trade in to be accepted. Rotax reserve the right to end the program earlier should the allowed amount of engines be allocated before the end date.